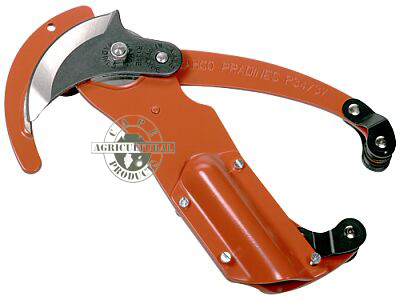 The Bahco Top Pruner was invented in France way back in 1934 and has become the industry standard top pruner offering superior cutting performance and strength. It was developed to cover the requirement of a tool to prune trees above normal working height without carrying a ladder around. Used together with a telescopic extension pole [see below] it is possible to cut branches at a height of up to 6m. Bahco top pruners are bypass tree secateurs with stamped and fully hardened blades which are precision ground and have a double-bevelled edge. The first bevel ensures easy cutting and the second bevel gives more strength to the blade, makes it stay sharp longer and also offers the possibility to resharpen the blade many times. We believe the P34-37 is the best top pruner available on the market today, satisfying even the most demanding users. It has a fully hardened, double-bevelled blade and a stamped fully hardened counterblade. The sap groove prevents the blade sticking, eliminating wasted time and effort. The triple action pulley and lever action gives an amazing amount of cutting power. One of the great things about the P34-37 is that it has an adjustable clamp which means it can fit onto poles with diameters ranging from 25mm to 35mm. Another nice feature is the ability to mount a pruning saw blade on top of the pruner as seen in this picture. By doing this you can saw occasional branches without having to remove the P34-37 from the pole and mount a complete pole saw in it's place. 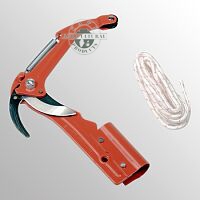 When using the top pruner the user places the counterblade over the branch being cut and upon pulling the rope the blade will cut from below which ensures the falling limb does not pull a strip of bark off the tree. Delivered with a 5m rope and plastic toggle/handle, and can be mounted on any of the poles described below. The P34-27A top pruner is the lighter duty top pruner available from Bahco and is ideally suited to gardeners and professional users with less demanding applications. The P34-27A also has a fully hardened blade together with a stamped, hardened counterbalde. On the P34-27A the counterblade is replaceable. A sap groove on the counterblade prevents sticking. The steel clamp tightens with screws enabling the user to fit the tool to a pole with a diameter of 25mm. 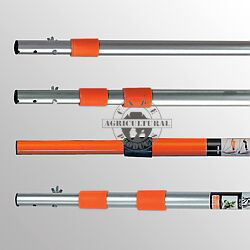 Bahco telescopic extension poles are available for use with the complete range of Bahco top pruners and pole saws and 3 variants are available in South Africa. The Fibreglass pole is ideally suited for use where there is a risk of coming into contact with electricity lines, while the aluminium poles offer durability. All poles are easily extended and locked in place with a simple twist on the sections, supplied with wingnuts for attaching Bahco pole saws.